The longer that Ethanol Defense is around, the more positive things we hear about it. With non-ethanol gas getting harder and harder to find, boat owners (who previously could count on at least being able to pay extra for non-ethanol marine gas) are looking for solutions to prevent ethanol problems in their boats as they come to grips with marine ethanol gas. 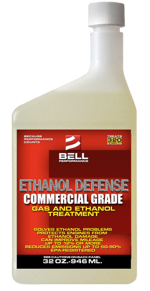 I want to thank you for introducing me to Ethanol Defense. My past boating experience had been a nightmare because of the introduction of E-10 gasoline and the effect it had on my last outboard motor. I have owned my pontoon boat for 26 years and I and my family truly enjoyed the boating seasons we've had until the E-10 problems of the motor not wanting to start, rough idling, stalling at any given time. I have also witnessed a lot of boats having to be towed to their docks because of motor failure that was probably caused by the use of E-10. To solve my problems, I bought a new Evinrude 40 h.p. Etec engine in 2013 and have used Ethanol Defense faithfully in the boat fuel and I and my family are enjoying boating again. I also use it in my truck, riding mower, push mower and snow blower. I don't think there is a better product on the market than Ethanol Defense and I highly recommend it's use over any other product of its kind!!!!!!! Thanks for the kind words, and happy boating!